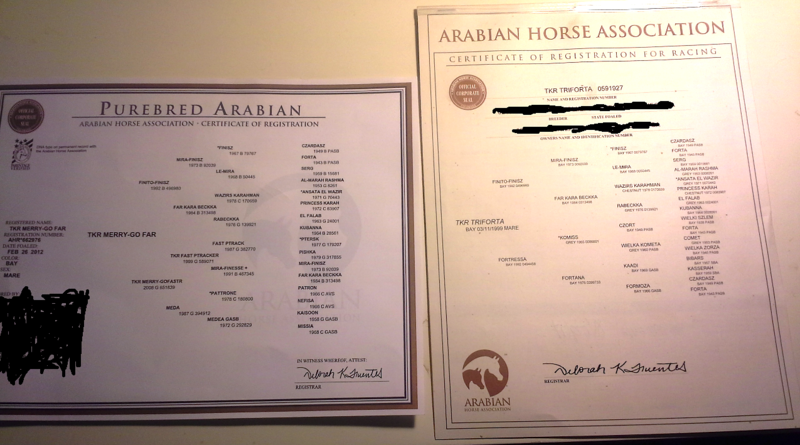 On Friday I submitted two transfer of ownership forms to the Arabian Horse Association. One was a very timely submission for Merrylegs. Can you guess who the other one was for? After 6 years 5 months and 1 day of ownership, I finally submitted Farley’s transfer of ownership. Does this mean I’m keeping her? The fee wasn’t too bad. $55 for Merrylegs and a mere $90 for Farley. I would have been tempted to date Farley’s transfer more recently (it was signed but not dated) if the penalty was more than $35, but for that amount, I want to the record to reflect the actual date I got that little bay mare named “Estella”. I’m really hoping that when the registration papers come back they maintain Farley’s registration for racing. Just because I think it’s cool :). Now I suppose you want a Merrylegs update. She continues to be the most laid back young horse I’ve ever been around. In fact, yesterday I begin to wonder whether she’s too laid back for the job I have in mind for her. And then I remembered that Farley was and is exactly the same way. And remains completely laid back on a day to day basis….except when it’s time to do her job. I’ve never gotten anything but compliments from people on how easy she is to handle, and Merry is shaping up to be very similar. Merry comes up to me no matter what – even if she’s eating – and totally wants to hang out. She’s cuddly without being pushy. It’s amazing. 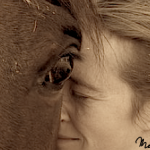 My last 2 personal horses (including Farley) were/are typical race bred personalities. Friendly and have a relationship with me, but are “polite” and a bit standoffish. When I drove up to Funder’s trailer at Derby where Farley was waiting, Funder told me that Farley started nickering for me as soon as she heard my car, before I actually came into sight. I’m definitely on Farley’s list as a “very important person” – but as much as it warms my heart…..it’s also very obvious that her affection is linked to my status as “bringer of goodie buckets”. Merry’s affection, at least at this point, is different. It seems linked more to me as a familiar object in a world that changed, and a desire for company. Today (Thursday) she started to take just enough liberties that I think it’s time to move onto the next step – actually asking her to do stuff beyond just standing there quietly for scratches. It feels good to be moving along at her pace. What should Merrylegs’ color be? I’m not promising to go out and buy all new equipment for Merrylegs’, but having a color in mind as purchases need to be made helps my indecisiveness! My barn color is red – red buckets, red rakes, red stable equipment. This works out well because all the barns I’ve boarded at have had “blue” as their color. In addition to a “barn” color, each horse has their own color. Minx and Farley were completely different sizes so I had to have 2 of everything, and it made it more convienant to have their tack color coded. Minx’s color was red on black. Most (all?) of her tack was red and black. I sold most of Minx’s tack after she died because it was definitely *not* arab sized. Farley is orange on black. Mostly because of my renegade boot involvement. There is one exception – my stirrup cages. When I bought them, they didn’t have orange in stock, black was boring, and the bright blue and lime green was SO PRETTY. Besides Farley’s set of tack I own a black biothane bridle (no color because I couldn’t decide…and Matt decided black went with everything – and he was right! ), and a red on black breast collar that used to be Minx’s that I didn’t sell because I REALLY liked it and it sorta cinches down to arab size. So, there’s definitely tack to be bought at some point!!!! Or at least some personal equipment of Merrylegs that doesn’t need to be barn colors. Some color combinations I like…. Yellow on blue. This is actually what I use with Tess. Does anyone have any other favorite color combos that look good on a bay horse? I like orange/blue…I know several Renegade people who use that color combo because the orange boots look good with blue tack. The bright blue and lime green stirrups are so sharp, why not keep going? I thought of that….I’m just not sold on the green/blue type color groups for a dark colored horse. If it was a grey, I think I would go to the bright blue/lime in a HEART beat. …it never occurred to me that one could have one’s own color that was different than one’s horse’s color. REVELATION! I think yellow and black is SUPER sharp on a horse that can pull it off. I wouldn’t try it on a light yellow-y bay, but I think it’d work on her. Orange on blue rubs me personally the wrong way (which of course isn’t your problem!) and Renegade yellow isn’t quite “pure” enough to look great next to blue…but I bet it’d look snazzy on red. Pony on fire! I think it was Ashley from GoPony that completely justified having a barn color versus horse colors!!!! It completely blew my mind. I had completely forgotten about the red-yellow combination. It was a combination that I was actually moving towards with Minx died, but then I sorta forgot. :). I’m not totally sold on the blue base for a bay horse. I think it would look fine on a light colored animal/horse but I struggle with blue on a brown or black horse. Tess looks GREAT with blue as a base color and I think Tig looked good in blue – but both of them are white/grey. Chestnut’s would probably carry a base color of blue better too? Am I the only one in the world who hates blue on chestnuts? I like dark greens on bays, too, and you could do yellow on dark green or lime green on dark green. For some reason the thought of hunter green or a dark green makes my skin crawl. Probably some unpleasant horse related memory that I’ve suppressed. But yellow and dark green don’t elict the same reaction for some reason. Hadn’t considered that combo. That is one to keep in mind. Not the only one! I can’t put my finger on why, but that blue on chestnuts does nothing for me. I like it okay on bays in the abstract but I have written “bay w/ blue” on so so many XC jump-judging forms that I could never bring myself to recreate it. yellow and blue if you must, but lime looks fabulous on a bay. With green boots. I love lime and blue on bays – as well as blue rich royal blue and gold – I used that on my bay horse way back when. FYI I think my fav’s so far mentioned are yellow on red, and yellow on dark green (for some really on reason….). I _like_ the yellow-and-dark-green idea! It’s unusual and I bet it’d look great. American Trail Gear has several SHADES of blue, and they will send a whole bag of samples so you can try different biothane combos right against your pony’s hide. I thought neon pink and neon orange would be hideous on a bright chestnut horse, but when I see IRL on Hana, I gotta admit that it totally pops. Lesson learned: use the samples and put them on the horse to see how it actually looks. I hear you. Farley got to use hand me downs from Minx (of what would fit her) until last year when I did Tevis with Renegade and they gave me a set of black and orange tack. Voila! Farley has a set of *real* bright endurance tack. If I went with blue I think I would go with the blue that is on my lime/blue cages. It’s really quite pretty and the perfect combination. That’s a great idea about the getting test strips from ATG. That and start paying attention to photos of other people’s bay horses and what looks good on them. Indecision! But this is the fun part, and since I don’t have to decide right away I’m going to try and not get impatient and enjoy the process of deciding what color looks exactly right…. Seems like yellow will probably be at least one of the colors so maybe it’s time to switch her out of the boring black halter and into the bright yellow one that I don’t use for Farley anymore (Farley doesn’t need a rope halter and I really like using the biothane on a day to day basis so it’s just hanging there….). Yall really have ~feelings~ about colors, and I am endlessly amused by it. I just like purple, but not all shades of purple, so blue is my backup (that’s ended up being the primary.) I think having a mostly-white horse makes it a little easier – even I can see that some colors look heinous on a chestnut. I think you should keep part of the colors as red, to tie into your barn colors. And with a name like Merry, red and green is your obvious choice. I think that’s why yellow and red appealed to me way back when – because it keeps a part of my barn colors. I am NOT doing green and red. NO WAY :). We won’t even add that my middle name is Noelle…..